Challenge yourself to cycle across the mountains of northern Vietnam and Laos, and be rewarded with an experience of a life time. Starting in Hanoi, cycle as far as Luang Prabang (11 days) or all the way to Vientiane (17 days). Cycle majestic mountains, go tiger spotting on eco-safari’s, stay in local homes, learn from NGOs in regards to the effect of unexploded land mines and enjoy incredible food. This is arguably our most challenging, and rewarding Social Cycles adventure. It is not for the faint hearted! Send me the itinerary and info pack please! If this is your second, third or even fourth Social Cycles adventure, then we’d like to welcome you back with a special SC Ambassadors rate. Just book as normal and we’ll apply the discount on your invoice. We’ll remember you! 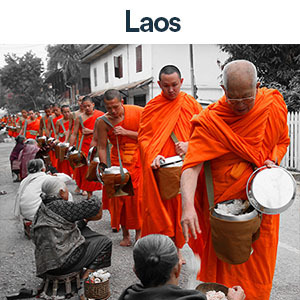 This 11 day trip will enable you to experience the real Laos in the most spectacular part of the country. This is not just a cycling tour . . . you will enjoy the boat trips that include a fascinating night safari, the side trips to archaeological sites and even a hands-on visit to a hamlet where spoons are made from ordnance found locally. Arrive in the thriving city of Hanoi and check in to your hotel any time from 2pm. Spend the afternoon finding your feet, before meeting up with the rest of the group in the evening for dinner. There is lots to fill spare time in Hanoi: walk around beautiful Hoan Kiem Lake, with the reflection of modern office buildings, old Buddhist temples and the tangle of ancient streets in its still surface, or maybe dive into culture at the Vietnam Fine Art Museum or The Vietnamese Women’s Museum. We’ll dine together for dinner at KOTO restaurant, a social enterprise restaurant focusing on vocational training for marginalised local youth. This morning you’ll get the chance to explore the Vietnamese capital in more depth by bike. Full of parks, lakes, and tree-lined boulevards, the city is known for its laidback atmosphere. We’ll spend the morning learning from our first NGO. In the afternoon, you’ll have time to visit the Ho Chi Minh Mausoleum complex, which includes the Buddhist temple One Pillar Pagoda and the former residence of Vietnam’s most famous revolutionary, Ho Chi Minh. There’s also time to explore the vibrant Old Quarter, an architectural museum where blocks of ochre buildings give off the air of a 1930s provincial French town. Leave behind the hectic pace of life in the Vietnamese capital Hanoi and journey to Ninh Binh, you’ll really have the opportunity to soak up one of Vietnam’s most spectacular views – limestone karst peaks thrusting out of serene rice paddies, the sounds and views of the river, which winds through the fields and has boats parading up and down its length. Following our bike ride, we’ll stop for lunch at a local restaurant before visiting Trang An, a new addition to UNESCO’s list of heritage sites. Here, we’ll board row boats for a 3 to 3.5-hour journey through caves, passing local villages along the river system of the Red River Delta. Leaving Ninh Binh in the morning by bus and drive about a half-hour to Dong Dao plantation, where we start cycling. Today we cycle about 30 km on the panoramic road to Cuc Phuong National Park. We will go through the pineapple plantations, valleys, villages, meeting friendly locals along the way. Arrive in Cuc Phuong about at noontime; we enjoy our lunch at the local restaurant here. Afterwards, make a visit to the Primates Rescue center. After breakfast, we’ll make our way towards the Laos border. There is still some distance to cover, so there will be a mix of scenic cycling and transit by van. The aim is to get to the border in the early afternoon, where we’ll do a land crossing. At this point, we say goodbye to our Vietnam guides and hosts, as we transfer to Laos and meet the Lao team, who will be with us util the end of the trip. After crossing the border, we’ll transit to Viang Xia. After breakfast, we’ll spend the first part of the morning exploring the natural beauty of the famous Viang Xia caves. We’ll venture through Khayson, Souphanouvong and Nouhak caves, all named after former leaders and royalty. The evening will be in the small village of Ban Tad Saleuy where we’ll spend the evening in a local homestay. Immersed in the magical world of Nam-Et Phou Louey National Park, Nam Nern eco-lodge has rightly been the winner at the World Responsible Tourism Awards twice. The bungalows are built by locals, the food is locally grown and prepared. We’ll have the chance to enjoy authentic, delicious dishes like Soop pak (a traditional Laotian steamed veggie dish) and Khmu tempura. As an incentive to preserve the local wildlife, the more endangered animals you see, the more money the local villages receive, thus encouraging further eco and conservation projects. We’ll take multiple boat rides (day and night) and go on hikes to salt licks with expert trackers, all the while learning about the conservation programs. This is by far the most interactive NGO experience of the trip. After a home made family breakfast, we will say goodbye to our hosts for the night and start cycling to Vieng Thong. The 95km journey comprises of some challenging mountain climbs and downhills. The beautiful bends in the well paved road make for some of the most scenic cycling in Laos. Viengthong District was under the same jurisdiction as Pak Xeng District, Luang Prabang Province and was a Buddhist settlement called Muang Hiem, which means “beware of the tiger”, alluding to tiger attacks in the area. The first 12km from the guesthouse head straight up. An above sea level height of 350m turns to 1050m in just 12k. It’s enough to make the strongest riders jump in the van, although if you’ve had enough coffee, you’re welcome to attempt it (provided the road is in good condition). The undulating road for the following 60km is an incredible insight into local village life amidst beautiful tree lined roads. The road feels almost flat (compared to what you’ve just done) as we enjoy our last cycle day into Luang Prabang. On the way, we’ll visit Pak Ou caves and then look to take a boat for our final journey into Luang Prabang. Our last dinner together will be enjoyed at Friends International restaurant, Khai Phaen. You’ll have the chance to learn from one of the Friends International leaders and find out more about local challenges, programs and initiatives set up within the ‘Saving Lives’ and ‘Building Futures’ programs. If there is no ‘clients’ at the time of our visit we will be able to visit their social drop-in center next door. Today a minivan transfer to the airport will round up our trip. If your trip is later in the afternoon you will have the afternoon off to explore this beautiful UNESCO world heritage city! Should you wish to extend your stay for a few days, just let us know and we can offer an extension package as per requests. If you’re continuing your journey to Vientiane with us, then you have the day to relax and explore Luang Prabang. It’s a tough day today, with a total distance of 135km from Luang Prabang to your hotel, and very little of it is flat! An early start will beat the small amount of traffiic that roams Luang Prabang and you’ll be able to cycle as far (or as little) as you’d like. We’ll allow the day for strolling through the beautiful mountain scenery and get into Phou Khoun for around 5pm, whether it be by bicycle or by car. Slightly less km’s than yesterday, this 128km ride is doable, but it’s not easy. The support van will be around all day to give you a lift if and when you need it. We’ll start early in the morning to escape what we can of the midday sun. With a little luck, there might be some cloud cover that day. Let me assure you though, this is some of the best cycling on the planet. The scenery is incredible and the villages are breathtaking. The reward of conquering this day is well worth the effort. In the morning, we’ll visit a local NGO that works with victims of land mines, still remaining from the Vietnam War. Before we start the days cycling, we’ll pop out to the Plain of Jars, a UNESCO World Heritage Site. It’s a tough ride today, taking us through remote areas and deep forest, where villagers still live almost untouched by civilisation. The 93km ride will be followed by the van the whole way if you fancy taking a break. Today we venture though Phou Khao Khouay to get to Thalat. In the morning we’ll head out of Paksan towards Tad Leuk waterfall at the side of the park. After lunch we’ll cycle through the park before getting a boat, for a two hour cruise through the National Park from Longsane village. The last day on the road! This epic adventure is almost at an end. Today you’ll click over the 800km point (if you started in Hanoi). The road flattens out somewhat as we near Vientiane. The cycling comprises of some more beautiful rainforest scenery as we ride near Nam Ngum lake. The ride finishes up in Ban Mixaiphoun, before we transit to Vientiane. Congratulations! You’ve cycled across a couple of countries, covered almost 700km in the saddle and more than scratched the surface as to what these fantastic countries are about. We’ll enjoy a final breakfast together before we get you off to the airport and on your way home. Laos is the most heavily bombed country in history relative to the size of population. The USA dropped more bombs on Laos during the Vietnam War than it dropped on Europe & Asia in all of WWII. There are an estimated 80 million unexploded bombs scattered across the country. We’ll meet just some of the NGOs tackling this issue. For every Social Cycles Adventure, riders are requested to contribute a nominal sum of US$150. During the course of the tour, you are given the chance to engage with, and learn from, local NGOs. This Social Cycles adventure has the unique opportunity to visit and learn from these projects. You can learn more about the individual NGOs we visit on the next tab. The funds raised from each rider will be able to influence which project they would like to support based on their learnings throughout the week. In addition to building a profile for our impact partners, Social Cycles also pays each NGO for their time and resources. We spend 1-2 hours with each NGO who are then remunerated, regardless of whether or not there is a follow up donation from the group. To make the most of Laos & Vietnam, we stay in a variety of different accommodation styles. In Luang Prabang, we stay in Villa Saykam, a beautiful French colonial style building in the heart of the UNESCO World Heritage City. Once we move away from the major towns and into the rural villages, we stay in clean & comfortable guest houses. All local guesthouse rooms have their own private bathroom with a western toilet. On our third day, we will spend the night with a local family in a traditional homestay. At the night safari, we will be able to enjoy the eco-lodge bamboo huts by the river in the national park. In 2018, the Cycle Vietnam to Laos adventure is co-hosted by Social Cycles founder Brett Seychell. Brett is passionate about sustainable travel and enriching experiences by engaging with local experts. That’s why he will co-facilitate the 2017 tours and connect riders with local experts. To obtain an authentic Laos experience and truly gain from local knowledge, the adventure is co-hosted by a local Laos bike tour operational expert, based in Luang Prabang. The Vietnam side is hosted by a local Vietnam team. We will be changing teams at the border. Sticky rice, fresh vegetables, mountains of fresh herbs, fish and meat, fish sauce, chilli, spices, fruit and more sticky rice… one of the wonderful features of the Lao diet is the almost complete absence of processed foods. Ironically, it’s the poor economic status of this small, landlocked South-East Asian country that has kept its cuisine fresh, vibrant and healthy for hundreds of years. Lao’s culinary offering includes universal hits, like steamed fish in banana leaf and pork laap salad, alongside options for the adventurous eater, such as duck’s blood salad. In Laos, we partner with a local supplier for the hire of our bikes and as a result, there is a great range that are designed to deal with the local environment perfectly. The bikes used are either Trek 3900 and/or Giant Rincon mountain bikes. Each mountain bike comes with a helmet, lock, comfortable gel seat and a handlebar bag. All mountain bikes have a 24 speed gear set to help you get up and down those hills! The overall distance, should you cycle the whole way, is just over 840km over the 8 cycling days. In addition to that, there are a lot more hills than there is flat. More often than not, you’re either going to be climbing a mountain, or flying down! In total, it is a 16,243m ascent and descent over the trip. It can sound a little daunting, but with the aid of the support van, you can cycle as much or as little as you like. Should you choose, you can even just cycle the downhill! We take a minimum of four riders and a maximum of 12. We strongly believe that when you travel with a group beyond 12, there is a risk that voices and opinions may be drowned out when we have the rare opportunities to visit NGOs and ask questions to local leaders. Friends International are leading the charge in the ‘ChildSafe’ movement and the ‘Think Families, Not Orphanages’ campaign. Friends International have an office in Luang Prabang, which makes for a great introduction to Laos. Their programs of ‘Saving Lives’ and ‘Building Futures’ have been used as templates all over the world. Nam Nern Night Safari in the National Park of Nam et Phou Louey is supports the conservation of endangered wildlife, such as the tiger, gaur, Sambar deer, and white-cheeked gibbon. The initiative ethically balances tourism with conservation by financially rewarding local villagers to protect the wildlife, turning ex-poachers into protectors. Lone Buffalo Foundation are committed to improving opportunities for young people through English study and football coaching. LBF aims to enhance the opportunities for careers in the business and tourism sectors for Phonsavan’s young people. Quality of Life Association provides support to UXO victims, people with disabilities and UXO affected communities in Xieng Khouang province, Lao PDR.